Did you hit a rut with your strength training? Do you need a way to push through your workout plateau? Are you tired of the same old routine or exercises? If you answered yes to any of these questions, this article is for you. Unfortunately, the body is highly adaptive to resistance training and even the most persistent and genetically gifted exercisers hit a progress wall. However, by using the four strength boosting techniques I’m going to cover here, you will be back on your way to making strength gains and progress in the gym in no time. When performing strength training exercises, it is pretty common to see people using the traditional tempo scheme. The individual descends or ascends and lifts the weight at approximately the same speed until the desired number of reps is achieved. However if your progress has stalled, try exercising with a different tempo more specifically a pause rep. With a pause rep, an individual pauses for a second or more mid lift before ascending or descending to complete the rep. For instance, with the bench press an individual would bring the bar down to their chest, rest for a second or more, and then press the weight back up. How do pause reps help build strength? 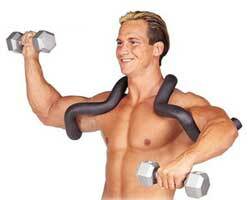 First, think of your muscles as elastic bands. Whenever you perform an exercise as the muscle stretches it has a natural response to recoil/snap back to its original length. This is known as the stretch reflex effect. However, when an individual pauses mid-lift they are essentially lessening or removing the stretch reflex effect in the muscle. This makes the lift more difficult to perform without adding any weight. When an individual becomes efficient at lifting a weight from a dead stop mid-lift, this will correlate to even bigger strength gains when performing the same lift with a traditional rep tempo. Working with chains or bands can be another excellent way to improve strength. Generally, towards the end of the lift is when the lifter is at their strongest and the half-way point is when the lifter is at their weakness. For instance, during a bench press when the bar is on the chest the lifter is at their weakness while when their elbows are extended at the top is when they are at their strongest. Adding chains to the sides of the barbell would allow the force to change proportionally with the lifters strength contributing to better strength gains. When you add chains to say a bench press, as the lifter descends the barbell towards the chest, link by link the chains begin to hit the ground. This lowers the resistance as the lifter gets weaker. However, as the lifter pushes up the weight, the chain link by link comes off the ground increasing the resistance gradually until the lifter reaches the top of the lift. Not only are bands capable of having the same affect, they can also be applied to have the reverse affect. Therefore, as the lifter descends into the hardest part of the lift the bands can assist and lower resistance while when the lifter ascends into the easiest part of the lift the bands stop assisting proportionally. Plyometric exercises or explosive reps are movements based upon exerting maximum muscle force and speed with the goal of increasing strength and power. When an individual utilizes their utmost force combined with maximum speed to move a weight, this is an exceptional way to produce increases in explosiveness which leads to more strength and power when reverting back to traditional exercises or exercise tempo. The use of plyometrics or explosive reps in an individual’s exercise routine helps increase the force and speed on muscle contractions. If your muscles are able to contract at a greater force or speed, they will also be able to move greater resistances. Try super-setting a traditional exercise followed by a plyometric exercise such as barbell squats followed up with jump squats. However, bad form in combination of high impact and high force/explosive repetitions is a recipe for injury. Therefore, when using plyometrics or explosive reps, it is absolutely critical to ensure proper form. We have all been there when you rack the weight a rep or two short of your goal in fear of getting stuck or pinned underneath the weight. How many times do you sell yourself short just to be on the safe side of things? When working out, safety is always a top priority, after all if you’re injured you probably are not going to be hitting the gym which is counterproductive to improving strength, however, holding back isn’t always the most effective way to improve your gains. A forced rep is exactly how it sounds. It is an additional rep forced upon your muscles that you normally could not achieve on your own. Enter a spotter or a weight lifting partner there to help you get the most out of your set. Whether it is a few words of inspiration or them assisting you with that last rep, those added reps over the course of a set, exercise, and workout will help you build more strength by increasing muscular overload. Although strength barriers happen naturally for every weight lifter, applying a new tactic to a training program can help a lifter continue to make strength gains and progress. If your workout routine is no longer producing strength results, trying adding one or all of these techniques pause reps, chains/bands, speed reps, or forced reps into your workout program.